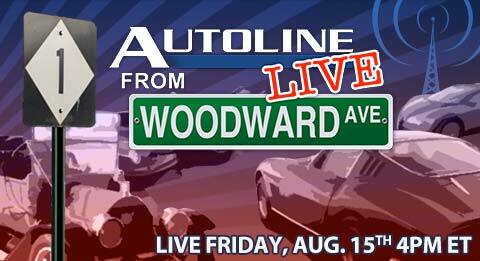 Coming Soon: Autoline LIVE from Woodward Avenue! Get ready for a special webcast THIS FRIDAY from the site of the biggest one-day automotive event in the world! Once again we’ll be back on the curb and ready to ogle the classics cruising up and down Michigan’s most famous avenue, Woodward. This year we’re welcoming a bevy of guests including Tricia Hecker, Director of Mopar Marketing; Jim Hall, automotive analyst; Richard Cox, Director of Dodge and SRT; Richard Rawlings, star of Discovery Channel’s “Fast N’ Loud”; and Steve Pasteiner, classic car expert and former designer. Start sending your questions in now using Twitter! Just submit them with the hashtag #WoodwardLIVEDodgeMopar.